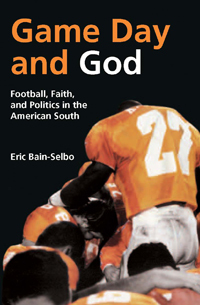 Game Day and God: Football, Faith, and Politics in the American South takes seriously the often-stated assertion that college football in the South is a religion. To this end, Eric Bain-Selbo draws upon a wide range of theoretical approaches in religious studies and cultural criticism. He also relies upon field research on several campuses in the Southeastern Conference where he interviewed fans and experienced “game day.” Consequently, the author is able to make the case that college football does function religiously for many people in the South. In addition, the author introduces key concepts and theories of religion and culture to a general audience. Game Day and God also recounts the role that college football has played in Southern history and culture. Going back as far as the Civil War, the work explains the cultural meaning of college football in the South, delivering a much-needed critical perspective to the subject. Scholars of religion will find the work a compelling extension of key concepts and theories to an otherwise “secular” activity. Scholars of American culture and sports will find the work to be an interesting case study, one that—unlike much work in the area—focuses our attention on the religious dimension of the phenomenon of sport in American culture. And general readers will find that college football or any sport can be much more than they imagined as well as discover important theories with which to make sense of the complexity of our daily lives.